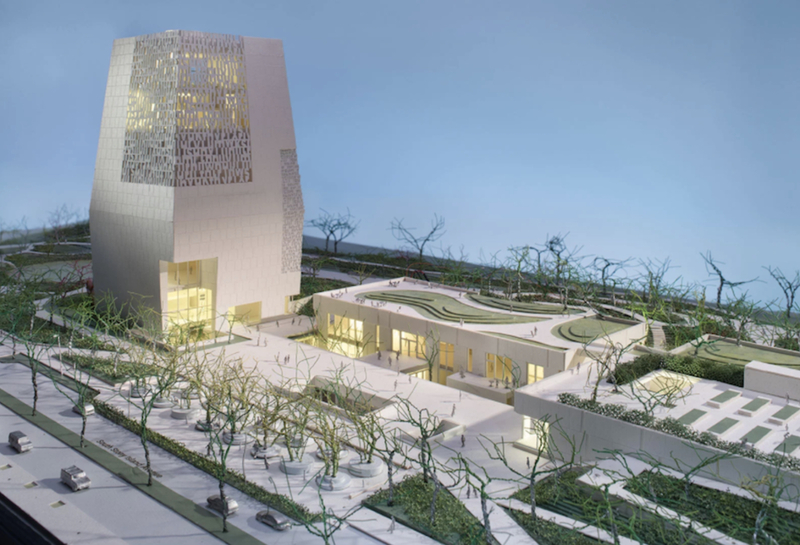 On October 31, the Obama Presidential Center Ordinance cleared the Chicago City Council, giving the city the authorization to put into motion several key components to begin construction on the center. While this is a step forward for the Obama Foundation (OF) towards building the Tod Williams Billie Tsien Architects–designed campus that includes a plaza, landscaped open space, and four buildings, the Obama Presidential Center (OPC) is still a long way away from breaking ground. Construction will not begin until the Section 106 review is complete and the federal lawsuit brought on by Protect our Parks is settled or dismissed. While the lawsuit and the federal review still impede construction, the ordinance passed by the City Council clears the remaining municipal hurdles, including several volleys between the OF, the Chicago Park District, and the City. Included in this authorization is the transfer of the land needed for the OPC from the Chicago Park District to the City, then to the OF, one of the most integral components to the project being the right of use granted to the Obama Foundation. The city will then allow the Obama Foundation control of 19.3 acres in Jackson Park for 99 years in exchange for a $10 payment. Also included in the ordinance is the approval of the closure of Cornell Drive, a move that many residents feel will lead to additional infrastructure improvements, and a revision of the 2015 site footprint to accommodate the newest plan outlined by the Obama Foundation released in May of 2017. Additionally, the ordinance calls for an advisory committee of community stakeholders to address the needs of the OPC once it is constructed and that no political fundraisers be held at the site. While the OPC will not be a federal presidential library, the ordinance implies that collection items from the National Archives and Records Administration may be displayed on the OPC site in the future. The ordinance includes a city resident construction worker employment requirement as well as other stipulations on what pools the OPC can hire from, but it does not address a community benefits agreement directly, something that several organizations, many of them consulting parties in the Section 106 process, have called for. Provisions were added to the ordinance saying that when local or state funds are used, 26 percent of contracts must go to black and latino-owned firms, and six percent for firms owned by women. Firms must hire Chicago residents for at least half of the work hours and “project area residents” for an additional 15 percent. On September 28 the Obama Foundation was subpoenaed for documents relating to the bid process per the court case brought on by Protect our Parks, which has accused the OF of pulling an “institutional bait and switch” via the divestiture of the Obama Foundation from the National Archives and Records Administration and the federal presidential library program. As a part of that subpoena, the OF released bids by The University of Hawaii, Columbia University, the University of Illinois at Chicago, and the University of Chicago. Among some of the most substantial reveals of this release were concept drawings offered by the University of Chicago for each of the three sites in their original bid. Charles Renfro, David Adjaye, and Jeanne Gang all presented concepts presented by the University of Chicago. No date has been set for the next Section 106 meeting, which will focus on the potential adverse effects of the OPC on Jackson Park as a historic resource. The National Park Service (NPS) has taken over as the lead agency for the National Environmental Protection Act (NEPA) review. Over concerns that the removal of trees would be considered a connected action as far as NEPA, the Chicago Park District halted efforts to relocate a track and field in Jackson Park hours before a public meeting on NEPA September 17. The OPC is still anticipated to break ground next year and will open in 2022.